Marc's recent video on building a lumber rack gave me the kick in the pants I needed to fix something that I've been needing to do for quite a while now -- revamp my lumber storage. I was originally going to use horizontal racks like the ones in this thread. But then I found pictures and descriptions of a vertical lumber rack, which I proceeded to completely copy. This was good, because now I see that my original plan to mount horizontal racks would have been less than ideal for me in many ways. Here's what I started with -- a big pile of wood on 2x4's that I bought at an auction a couple of years ago. As you can see, I couldn't get to the wood on the bottom or towards the back of the pile at all. I built a platform out of 2x4s and two pieces of 2'x4' plywood, and mounted a 1x4 board to the wall. I attached pipe flanges to the 1x4 board, and screwed in 18" lengths of galvanized iron pipe that the borg was nice enough to cut and thread on one end for me. I also attached some 1/2" thick strips of wood to the platform under the pipes to act as an additional stop for the lower end of the lumber to help keep things vertical. And here it is all loaded up. The other thing I really like about this project is that I now have my lumber sorted by species. I can see every board in this rack, and I only have to move one or two boards at most to get to the board I want. So what do I see as disadvantages for horizontal storage? First, I have a few boards that are really big. Think suitable for making a Roubo benchtop big. I have a piece of 12/4 cherry that's close to 15" wide and 11 feet long. Trying to muscle something like that onto a horizontal shelf is something I would have to beg a neighbor to help me out with. But with vertical storage, I was able to walk the board up onto the platform by myself. 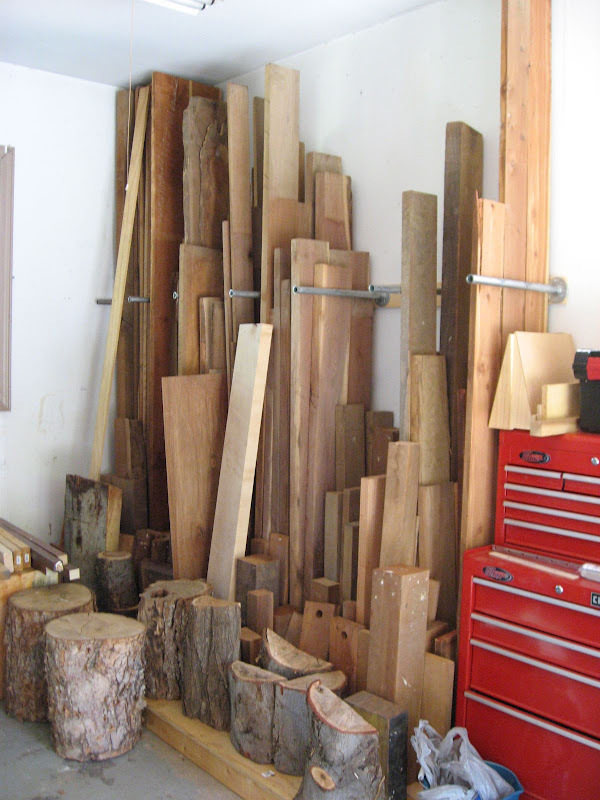 Second, I am able to store the same amount of wood vertically while taking up less floor space, which we wanted to get more of in the garage for storing our boys' bikes, toys, etc. Horizontal storage would still have a pretty big footprint in my garage. Third, it's harder to go through your boards with horizontal storage. Vertically, I can flip through all of the boards like flipping through pages of a book, whereas getting to the board that's at the bottom of a stack on a horizontal rack would get old fast. Fourth, building a low platform and attaching these pipes to the wall is much less complicated than making a horizontal lumber rack. I do know that this is not a method that will be good for everyone. I was able to get away with this form of storage because I have 10' ceilings in my garage. There's no way I could have put this in my basement, where my workshop is, and this would not be practical for people with low ceilings. But I love love love my new lumber rack. I wanted to post this to provide another method of storing lumber to consider. By the way -- the worst part of revamping your lumber storage? Having to move a few hundred board feet of lumber. 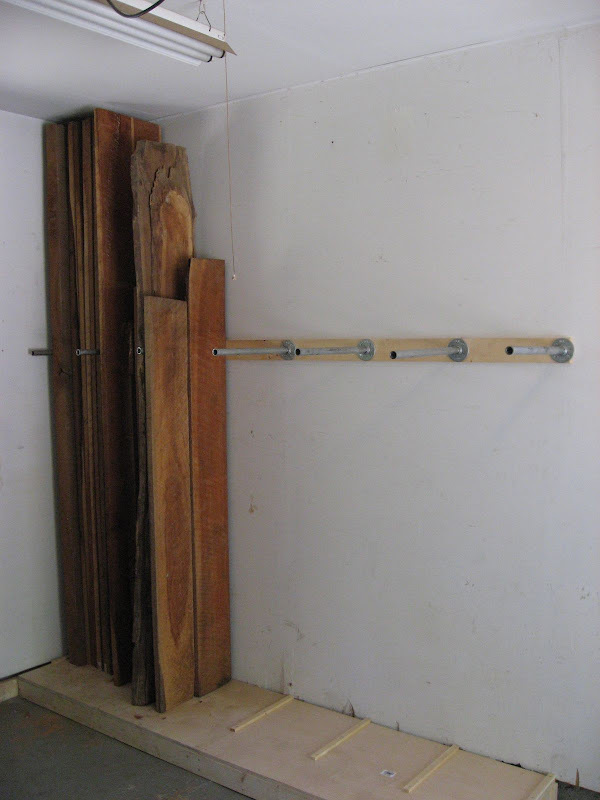 THE LUMBER RACK LOOKS GREAT AND AS YOU STATED IT MEETS ALL OF YOUR NEEDS AND THEN SOME. I AM GLAD TO SEE SOME ADDITIONAL OPTIONS FOR LUMBER STORAGE. 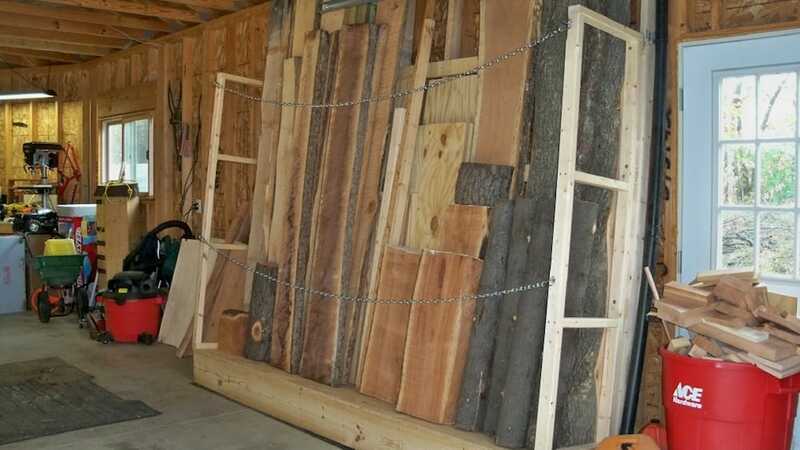 Does anyone else have pros/cons of storing lumber vertically or horizontally? I currently use vertical storage for dimensional lumber I find the longer pieces tend to bow a bit (sometimes more than a bit) the shorter pieces are just fine though. I am building a storage system along the north side of the shop I will store stuff out there in a horizontal plane so I can help to prevent this bowing I hope. I will still have a section for shorter pieces in a vertical position it is way easier to manage those pieces that way. 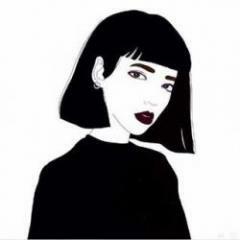 I like the way you used your space and hope it suits you just keep an eye on your longer pieces to see if they do bow. If they do just turn them I found this reverses the process most times. Nice design. The pipe flanges make the construction easy. Does anybody store their lumber horizontally, on edge? I store my shorts that way. Wood that is drying is always stored flat, stickered while dry wood may be stored any of the three ways. Well done, Wilbur. I like the design a lot. 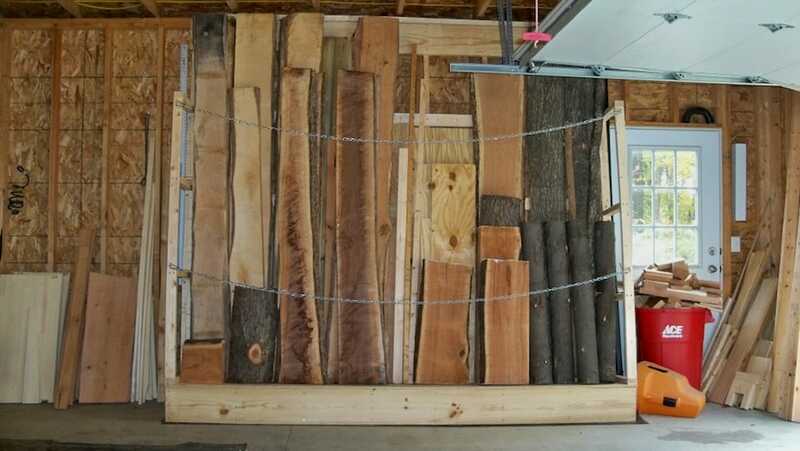 While you've gotten me to 2nd guess my intention, I'm going with a horizontal rack as my lumber is much smaller and I plan to mount it high on the wall as I have so little floor space. Thanks for sharing. I agree with you, Wilbur. I actually like a bit of both. horizontal for smaller pieces and for pieces beyond my 10' ceiling. Great design, Wilbur..thanks. About a year ago I was trying to figure out what kind of rack to go with for indoor storage, horiztonal or vertical. I read other woodworking forums where the horizontal vs. vertical debate went on I ended up going with vertical because I like the fact that the wood is much easier to access than horizontal. I think the main con is length. With a 10-foot garage ceiling I can't store long boards. But most of what I'm storing is usually 8-9 foot stock anyways. I think the main thing to think about if storing vertically is it's probably a good idea if you're going vertical to make sure the wood is relatively dry. I do the main air drying outdoors in my horizontal stacked solar wood drying hut and then after it's dried I bring it into the garage for vertical storing until I'm ready to use it. Everything in the vertical rack is about 10% MC on average. To add, if you look at the design of my vertical rack from the side you'll notice it's on an angle. I designed both for safety reasons and so I can add a yet to be built rolling sheet rack that will nest in behind it between the vertical rack and the wall. Something similar to Marc's sheet rack only with 4 casters that I can pull out from behind the vertical rack to access. I've also got some other ideas for all the other smaller scrap and cutoffs laying around to help get them organized as well.